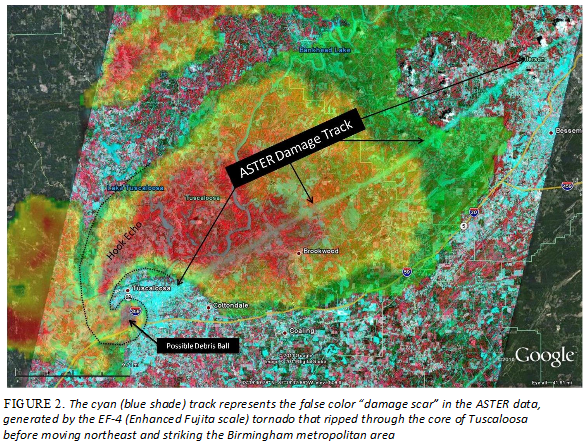 This whitepaper about NASA's Nebula project, describes how cloud computing was used by NASA's Short-term Prediction Research and Transition Center to identify damage scars left by tornadoes. Since then, Nebula was open-sourced to create OpenStack. If you look on the home page at http://www.openstack.org/ there appears to be a "Latest" section, and that looks to list projects using the technology, among other news related to it, I would suggest you read through that and other news pages on the site, you'll most likley find the info you need there. As I previously mentioned however, if you browse through the various pages of the site there are many pages that list amongst other things, Projects that use the technology. Not the answer you're looking for? Browse other questions tagged open-source-gis cloud-gis or ask your own question. Is there any open source library for reading OCAD files? Are there any open source mapping APIs/toolkits for drawing axes,labels,graticules etc? Are there any .Net opensource library for geometry operations? Are there any open source network analysis tools? Are there any decent free GIS projects built in C# or with a good C# API? Is there any open-source object-oriented GIS? Are there any open source tools for the processing of UAV images? Any open source raster applications that accept floating point rasters with attribute tables?